Mechanical weighbridges located at Norwin (west of Toowoomba) were recently re-commissioned by Accuweigh’s QWM branch in Brisbane. The mechanical weighbridges will be used for receiving organic material from Gold Coast Waste Treatment plants before being distributed to local farmers for improving soil conditions. 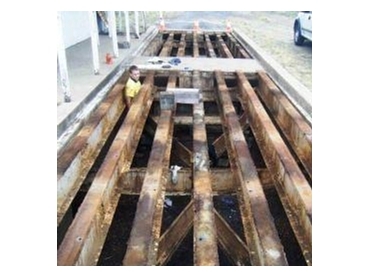 These aging mechanical weighbridges have a split deck layout to enable separate weighings of truck/trailer combos and utilise the original mechanical lever systems which were fully inspected and serviced by Accuweigh’s experienced weighbridge crew. The existing tension load cells fitted to the transfer levers of the mechanical weighbridges were retained and connected to new digital weighing electronics and a PC running weighbridge software to track all incoming and outgoing product. The mechanical weighbridges were fully tested, calibrated and certified using Accuweigh’s weighbridge test unit to allow trade weighings of product to be performed. Accuweigh’s Brisbane South branch was recently amalgamated with QWM’s Brisbane North branch to improve cost effectiveness for clients of both companies.